Green sauce is a family of cold, uncooked sauces based on herbs, including the Italian salsa verde, the French sauce verte, the Spanish salsa verde, the German Grüne Soße or Frankfurter Grie Soß (Frankfurt dialect), and the Argentinian chimichurri. The Mexican salsa verde, though also called a "green sauce" is instead based on tomatillos. The basic recipe is probably from the Near East and, as such, is probably at least 2,000 years old. Roman legionaries brought it to Italy, from where it was exported to France and Germany. Evidence suggests that it was introduced in Kassel by the Italian trading families Bolongaro and Crevenna around 1700. A possible origin of the German variant are French Protestant immigrants emigrating to Kurhessen in the 18th century. The German variant uses a different mix of herbs, since Mediterranean herbs were not available in Germany at the time. The Italian salsa verde is a cold rustic sauce, and includes parsley, vinegar, capers, garlic, onion, anchovies, olive oil, and possibly mustard. The ingredients are coarsely chopped, formerly by hand, now often in a food processor. In some regions, cubed bread is soaked in vinegar and blended with the other ingredients, which creates an emulsion somewhat similar to a vinaigrette. In other regions, there is no bread. Salsa verde is used as a condiment or dipping sauce for meats, fish, poultry, or vegetables. Salsa verde is traditionally served as an accompaniment to bollito misto or grilled or stewed fish. The French sauce verte au pain was already known in the Renaissance, and was originally a bread sauce very similar to the Italian. Today the term frequently refers to a kind of mayonnaise flavoured with tarragon, and sometimes parsley and sage. Lemon juice is often used instead of vinegar. Grüne Soße or Grüne Sosse is a specialty of the German state of Hesse. Centres of popularity are the cities of Frankfurt am Main (where it is sometimes called "Grie Soß" or "Grie Soss") and Kassel, which lay claim to its origins. The Frankfurt-style is made exclusively from seven fresh herbs, namely parsley, chives, chervil, borage, sorrel, garden cress, and salad burnet together with sour cream, oil, vinegar, salt and added hard boiled eggs. (City of Frankfurt official page) Variants of other local areas, often due to seasonal availability, include dill, shallots, lovage, lemon balm, and even spinach. In more frugal times, daisy leaves, broad plantain leaves, and dandelion leaves were also used. While both Grüne Soße and mayonnaise have an egg base, there are major differences. In Grüne Soße, the eggs are hard-boiled, then sieved or pureed before being mixed with sour cream to form the creamy base of the sauce. The fresh chopped herbs are then added. Some variations use buttermilk, quark, or yogurt instead of sour cream. In the city of Kassel, a combination of sour cream and Schmand is used. The sauce is served cold with peeled boiled potatoes or just with rye bread, as an accompaniment to either hard-boiled eggs or roast beef brisket. It may also be served with cooked fish or roast beef, or as a side dish to barbecue. A local schnitzel specialty, called Frankfurter Schnitzel, is always served with green sauce, along with apple cider (Apfelwein) as a traditional accompanying drink. Green sauce was supposedly Goethe's favourite condiment; a legend that his mother invented it is likely apocryphal. The local importance of the dish is shown by the abundance of green sauce at local markets and by the Green Sauce Monument installed in Frankfurt-Oberrad in 2007. The latter consists of seven small greenhouses with the main herbal ingredients and was part of the Luminale, a local art and light event. 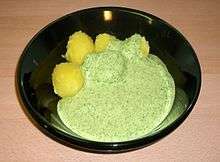 In many Hessian families, Green Sauce is part of the traditional meal eaten on Maundy Thursday, relating to its German name Gründonnerstag (literally Green Thursday). 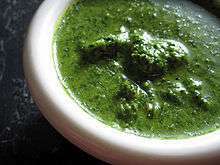 Chimichurri is a popular sauce in Argentina and other parts of Latin America, usually served on grilled meat.